In today’s day in age, everyone has an email address. It’s a necessity as much as having a phone. But, are you keeping your computer safe when you use email? How cautious are you being when you read your inbox? You may not be aware, but there are dozens of potential threats you could face if you don’t take the right steps to stay safe. Here are some quick tips you can follow to best keep your computer (and your private information) out of harm’s way. If you are using an email client (such as Microsoft Outlook or Mozilla Thunderbird) to read your email, then your first step to follow is ensuring that you regularly check for updates to your software. Software developers release updates to these programs over time to patch or fix any security vulnerabilities that may have been discovered after the software is released or even after the last released update. To protect your email account from hackers it is important to choose a strong password. This means that instead of using password or myname123 as your password, you need to choose something more secure. The most secure password are at least 7-8 characters and use at least one of each of the following characters: an uppercase letter, a lowercase letter, a number, and a special character (such as !, @, or $). In addition, it is best to use a unique password for your email that you do not use for any other online account. For optimum safety, you should use a different password for each website you have an account for. Every 90 days or so, you may also want to change up your password for even more security. Not only does antivirus software help protect you from contracting viruses via websites, it can also check your email to keep you safe. Most anti-virus programs today have a scanner that can scan every inbound and outbound mail for any potential threats that can be contained within a message or its attachment(s). If it’s not already active, turning this feature on will provide you with a extra automated measure of security. Nearly every email service or email client provides a spam filter to automatically remove known spam emails from your inbox before you have a change to even open them. This is great since some email threats can attack your computer simply by opening the email to read. Spam emails frequently contain links to dangerous software programs or sites that can harm your computer and private information. They can also be used for phishing, a scamming method that hackers use to collect personal information such as birth dates and credit card numbers. If you notice emails come through that seem to be spam but have not been filtered out, you can use the “Report Spam” button provided by email services to move that email to your spam folder and to notify others that the sending address may send out spam messages. Perhaps the best tip we can provide is to use your judgement to determine if an email looks suspicious. 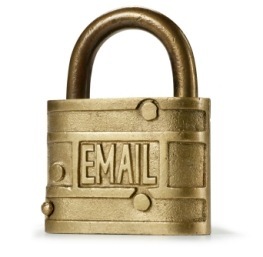 If an email does looks suspicious in any way, don’t click on any of the links it contains. If you’re in doubt that it is from the sender it appears to be from, open a new tab in your browser and type in the web address directly to go to the site, instead of clicking the link. Most major websites have a contact address that you can use to forward suspicious or fraudulent emails to – if you get an email from someone misrepresenting themselves, forward it on to the site owner. Follow these tips and you should be well on your way to staying safe when using your email. If you have any other tips for users to follow to stay safe on email and/or the internet, please feel free to share in the comments below.